This is a lengthy post – with skiers particularly in mind – of a descent of the Combe de la Vierge Italian variant of the Vallée Blanche – but the images should still appeal to anyone interested in mountain photography. Reading it all is not compulsory! Click any image to see an enlarged version. It is well worth it. 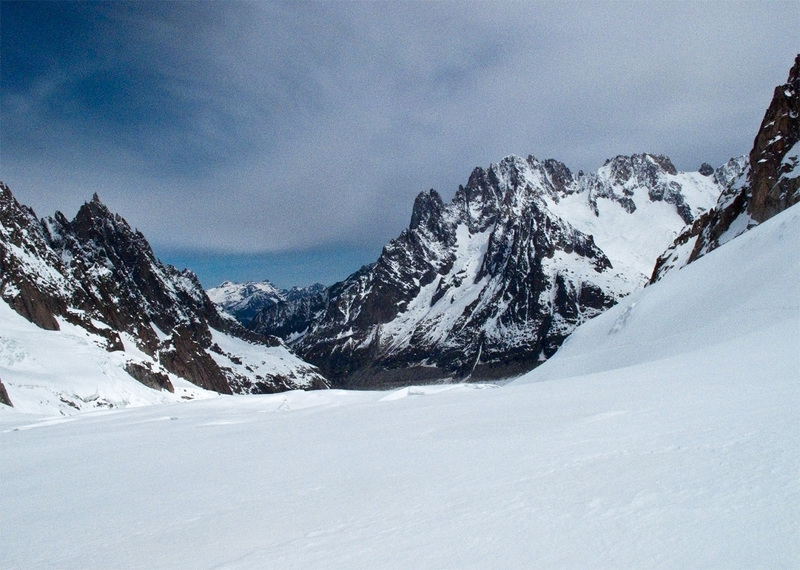 In early April 2011 (nearly two years ago as I write) I went on a Ski Mountaineering course run by Jagged Globe based in Chamonix. As an enthusiastic skier and a lover of Alpine Climbing (up to AD- level) I was keen to see if I could learn how to combine the two. But I also knew that the course was likely to lead to an opportunity to ski the famous Vallée Blanche – one of my long-held ambitions. 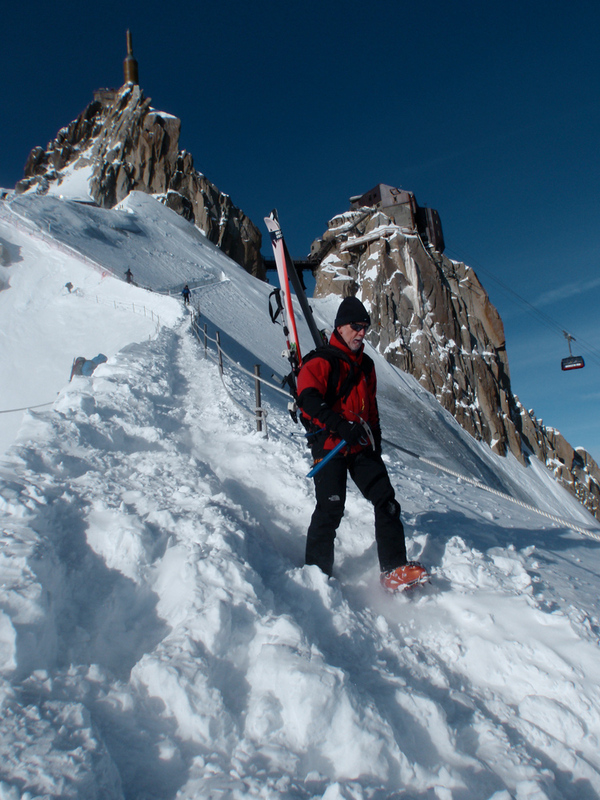 The Vallée Blanche is an off-piste ski run of about 17km rated by most as the greatest off-piste ski run in the Alps. 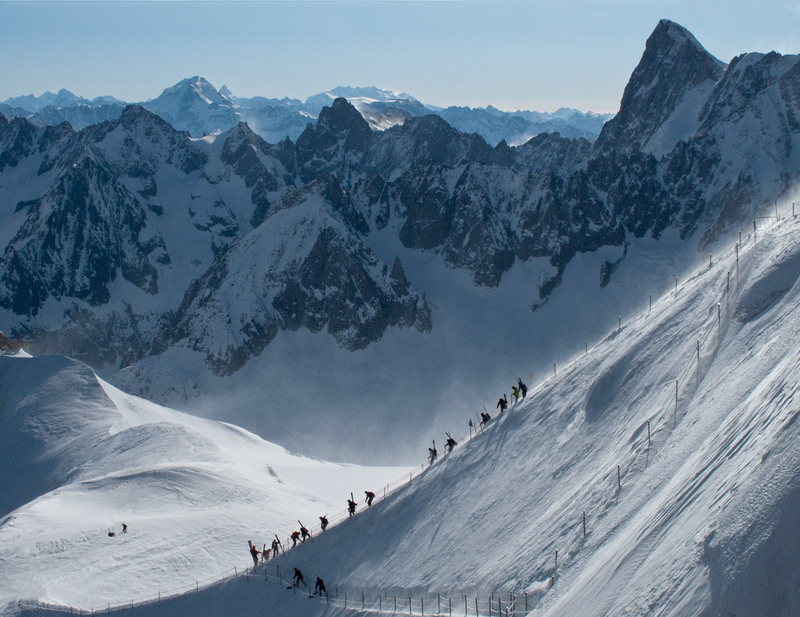 It starts from the top of the Aiguille du Midi (3,777M) at the heart of the Mont Blanc Massif and finishes at Montenvers a drop of approx 2,000M (6,500ft) several hours later. 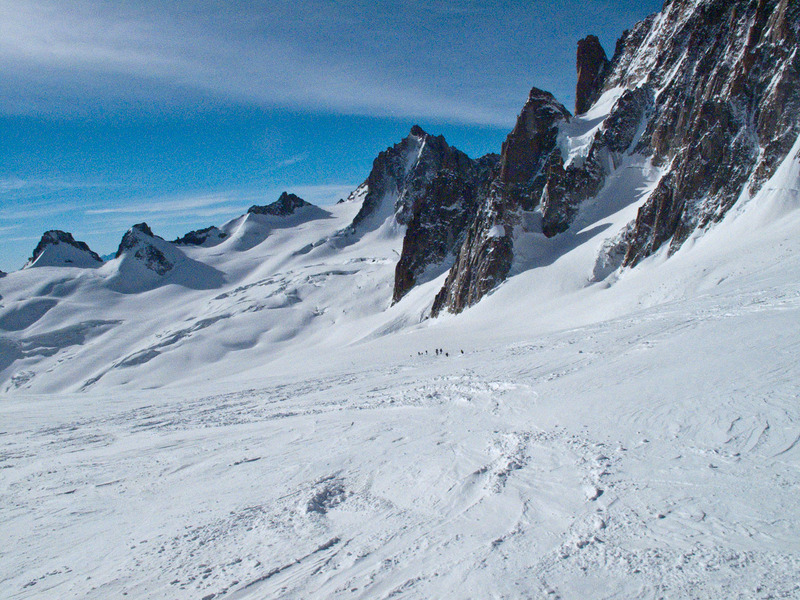 It may be possible to ski on down to Chamonix given the right snow cover. The start itself offers one of the most majestic viewpoints in the Alps from where the route threads its way through high glaciated terrain and eventually through the Séracs of the Géant ice fall before a final more leisurely run down the Mer de Glace to the finish. 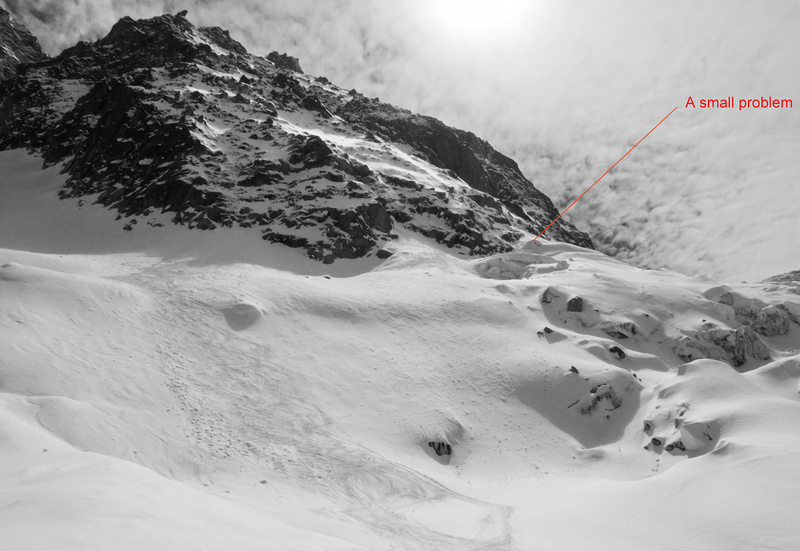 Totally off piste, unmarked and un-patrolled, it passes through heavily crevassed terrain. It’s a route only to be attempted by fit, properly equipped, skiers with a guide and in good weather. The remote high mountain environment poses its own risks: extreme cold and sudden weather changes. Check the forecast. The classic route is within the capabilities of strong intermediate skiers with off-piste skiing experience. Many people ski the Classic Route in downhill boots and all-mountain skis. But there are also several other routes, or variants, of varying difficulty. The conditions vary hugely depending on recent snowfall, the state of the route – well tracked out or not – and the weather. Be honest with your guide about your abilities, seek advice, and read the Office de Haute Montagne website and study the weather forecast (see links at foot of this post). Carry a transceiver, probe and shovel. At close to 4,000M in winter it can be extremely cold at the summit of the Aig du Midi. Never underestimate. 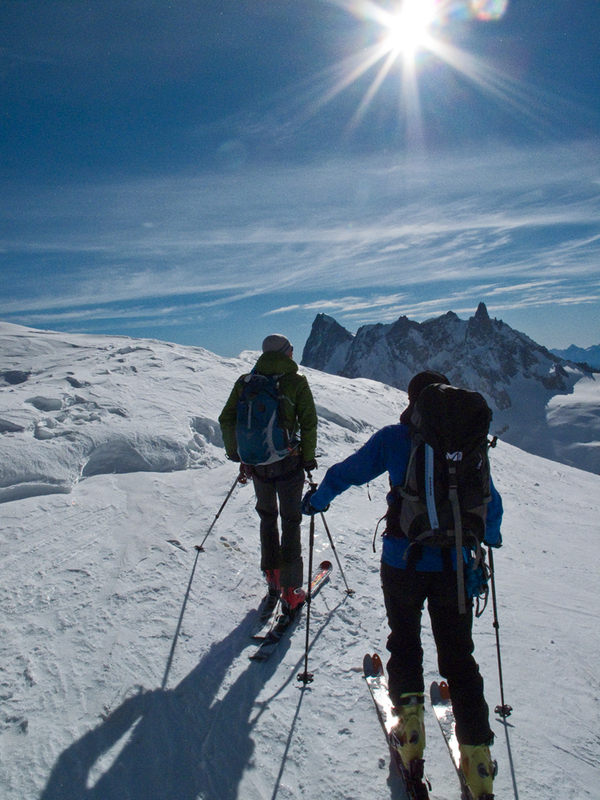 As I was on a ski mountaineering course we skied The Vallée Blanche in touring boots, carrying full ski touring kit. Our route (The Italian variant) included skinning uphill towards Helbronner, and a short passage involving a fixed rope to protect a tricky un-skiable passage. 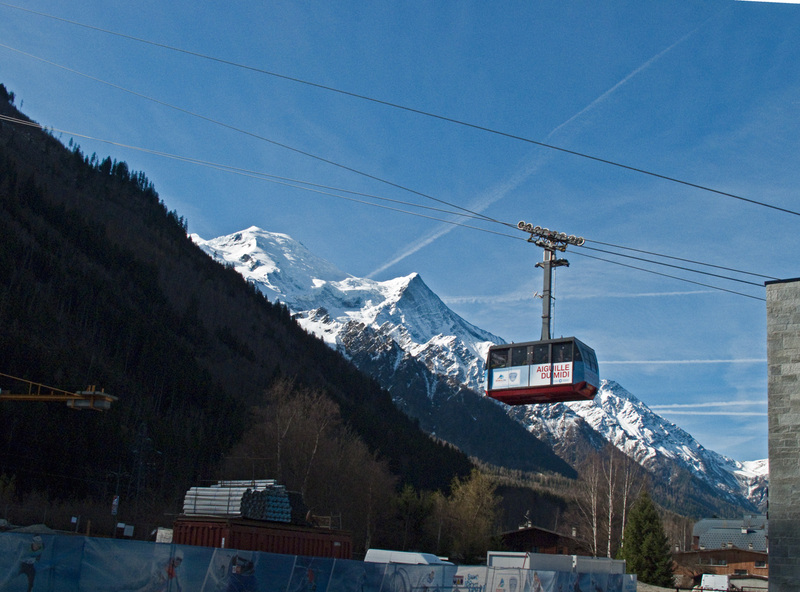 The Aiguille du Midi is just one small segment of the Mont Blanc panorama (click here for a post of that panorama) visible from the Chamonix valley. 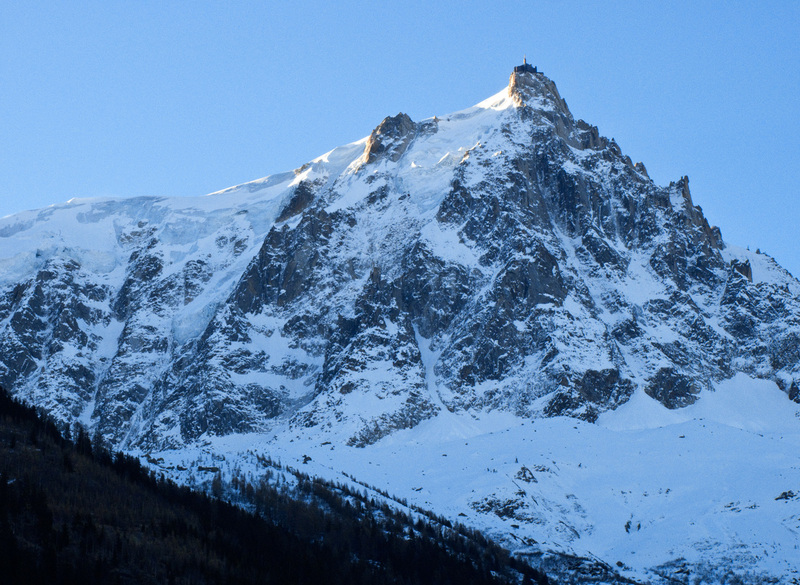 The famous, or infamous, Midi Arête (down which one must first descend) is the left skyline as seen in the views of the Midi from Chamonix, and the images above. 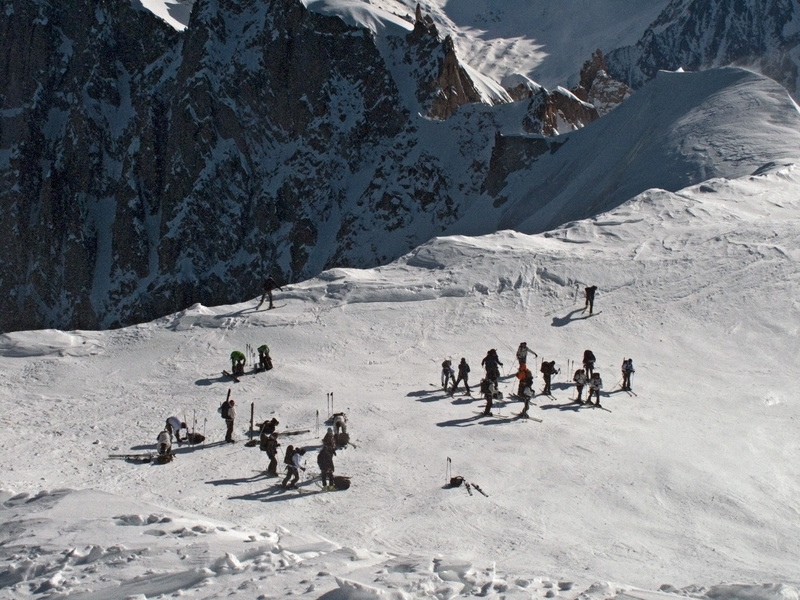 Skiing the Vallee Blanche requires an early start and by 07:30 the valley lift station was already crowded with skiers and their gear. 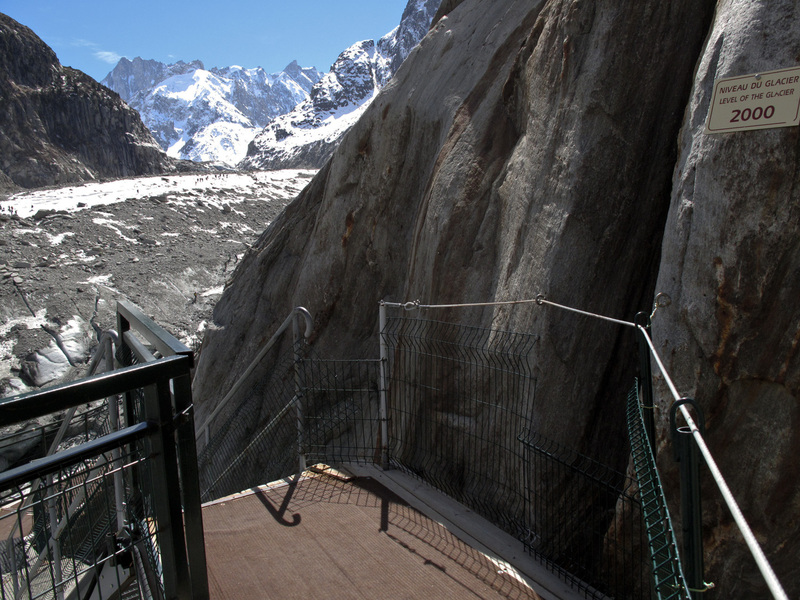 The Aiguille du Midi lift efficiently delivers you to the summit (vertical gain of about 2,700M) in two stages in about 20 mins. Exiting the Midi lift top station (07:55) we crossed an open viewing platform. From here you get your first view of the Midi Arête down which you will shortly walk. It’s an extraordinary sight, but possibly stomach churning if you are wearing treadless downhill boots or suffer from vertigo. A lengthy tunnel leads you to the final gallery and an ice tunnel before you emerge hopefully into dazzling sunlight onto a small snowy platform at the top of the Arête for your first glimpse of the panorama. If you are not astonished by what you see, then you are probably in the wrong place! The final part of the tunnel is chaotic. Likely to be filled to capacity with the latest cabin load of skiers all sorting gear, tightening boots etc. Skis and poles littering the floor, or propped against the wall. Finally geared up and ready, one almost has to fight one’s way out. Descending the Midi Arête is for some people the scariest part of the entire descent. 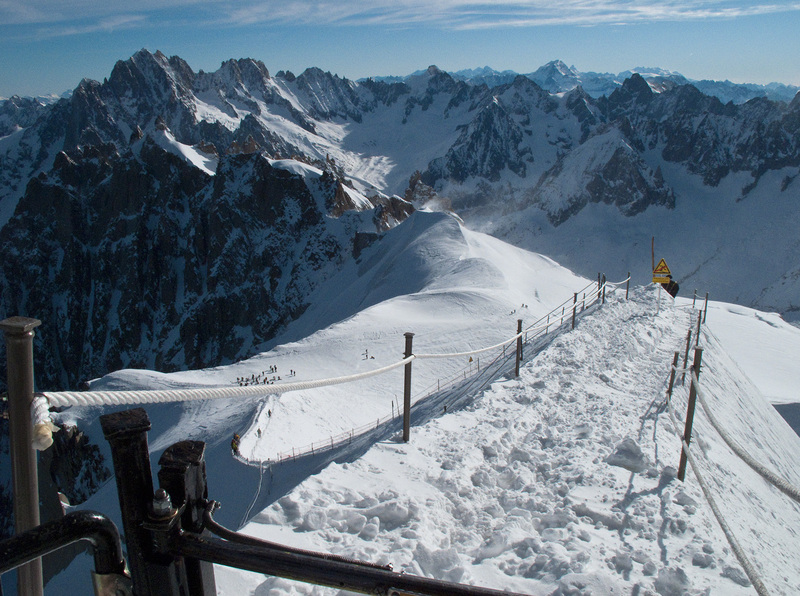 Thankfully a handrail is affixed in winter but even with that, in downhill ski boots with no tread and clutching ski poles and skis and with a vertiginous 2,700M drop into Chamonix on the left and a smaller but steep drop to the right, it can be an intimidating experience. 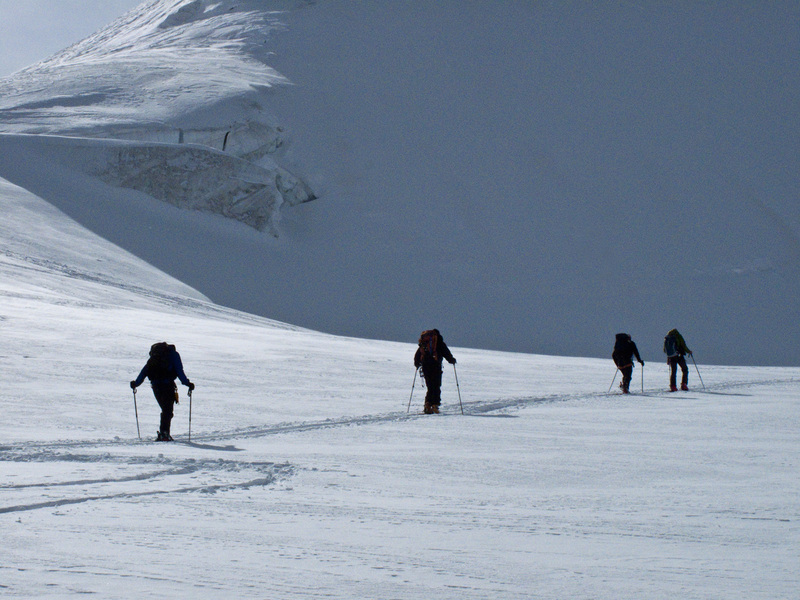 For us, with crampons fixed, skis and poles attached to rucsacs, and ice axe in hand it was a far simpler descent. 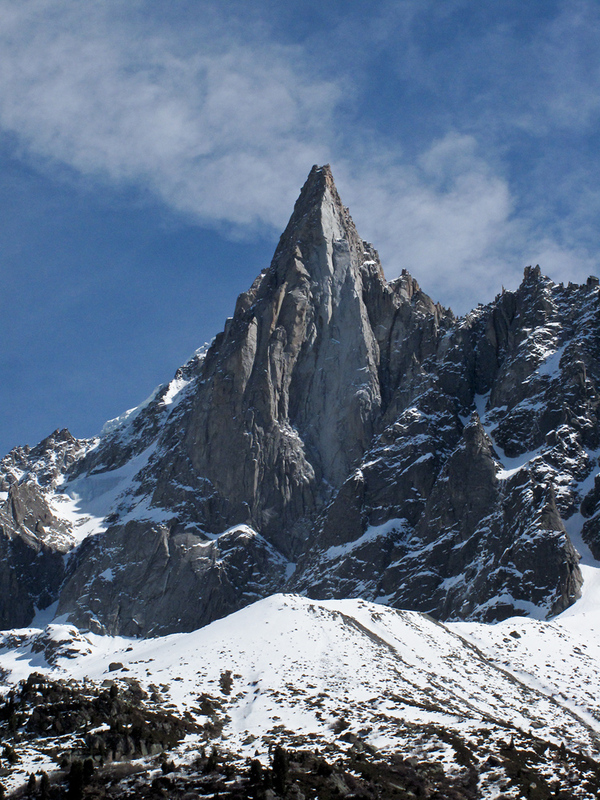 At the foot of the arête is the épaule (shoulder). This is the true start of the ski descent, the place to step into skis, stow crampons and other unwanted gear, and then finally we were ready to set off. The time was 08:45. 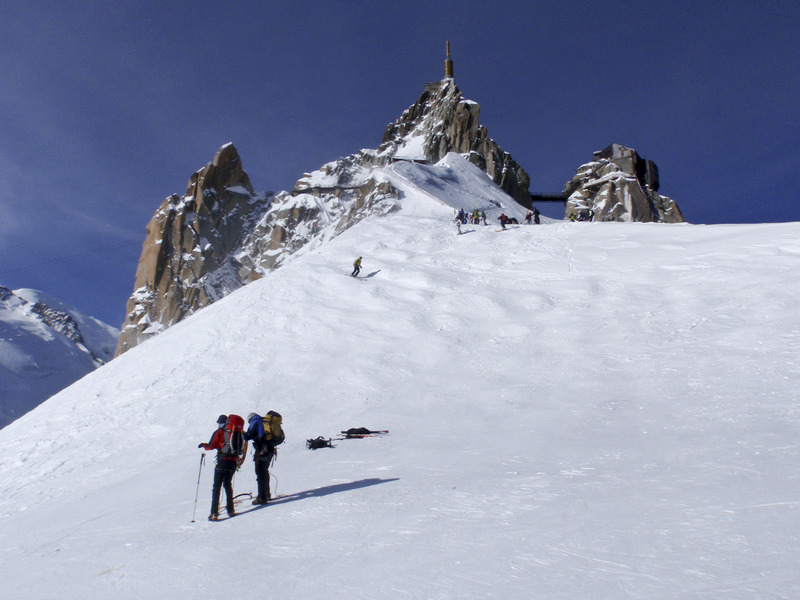 The Combe de la Vierge descent of the VB, is also known as the Italian Variant for the simple reason that it is the only route of descent directly accessible from the Helbronner lift on the Italian side of the Mont Blanc Massif. 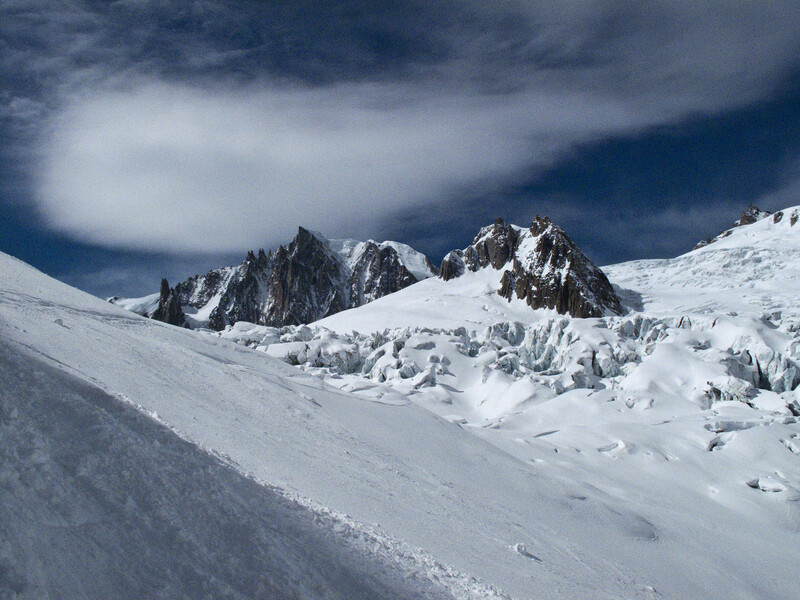 To reach that route required us to follow the initial path of the Classic descent route sweeping under the south face of the Midi before heading south-eastwards below the immense face of Mont Blanc du Tacul down to the Col du Gros Rognon and then further on to the lowest point in the upper Glacier du Géant. The skiing was on hard ruckled snow. At the low point the Classic route turns left through approx 90degrees to head down the main glacier. For us, this was the point to fit skins to our skis (09:15) before the 900ft skin up to the Col des Flambeaux not far short of the Helbronner lift station from which the Combe de la Vierge route starts. Fitting skins. Dent du Geant in the baclkground. Note the tiny string of four gondolas high in the sky. These link the Aig du Midi with Helbronner. Enlarge the image to see more clearly. On our skin up the panoramas were spectacular. Do enlarge the image above for a better view. We finally picked up the Combe de la Vierge route and started the descent at 11:15. The route traversed high above la Vierge and its rock comb before a series of descents and traverses brought us to the right bank of the glacier just above the Séracs du Géant where the slope of the glacier dramatically steepens and where it is squeezed between rock walls. 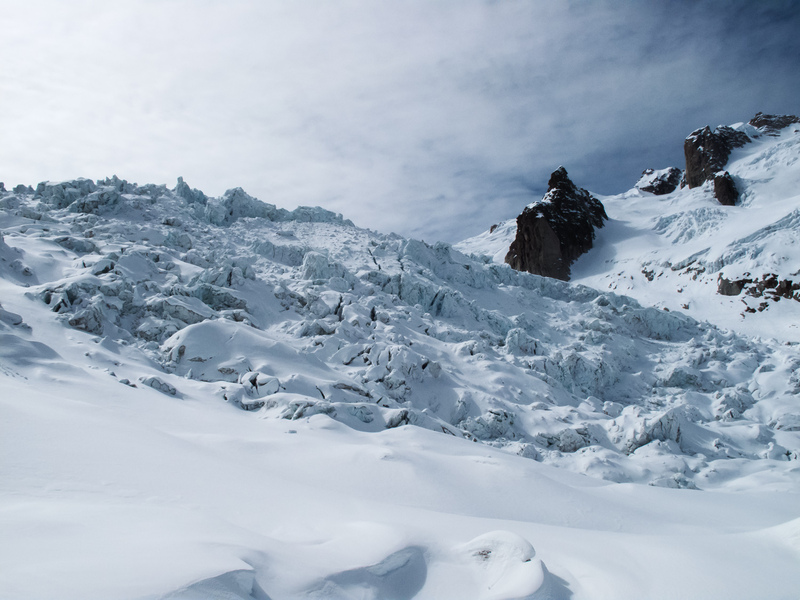 Closing in on the Séracs du Géant was an amazing sight – a chaotic maze of ice towers and deep crevasses. Somewhere on the other side of this ice fall other skiers on the classic route were winding their way through this area. 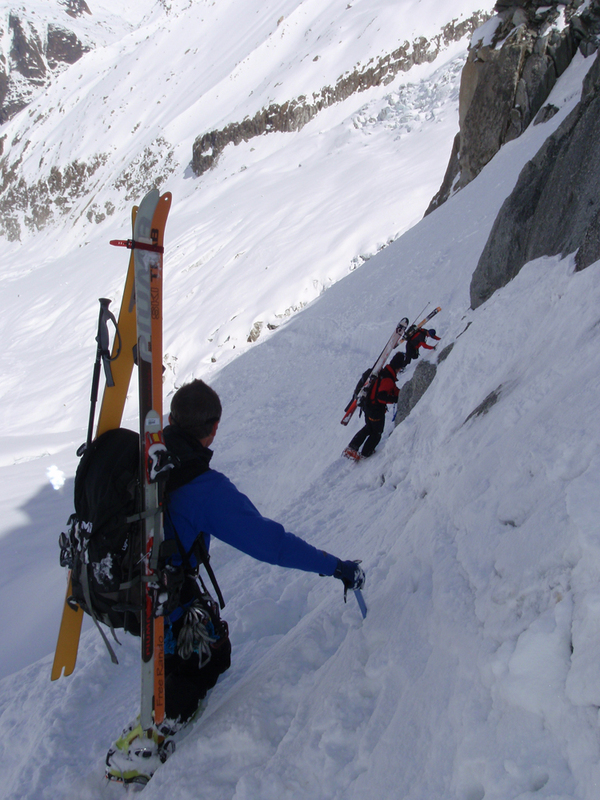 Rounding a particularly steep sloped traverse we encountered our point of difficulty. Rucsac off – secure with iceaxe. Empty rucsac (without losing anything) to extract crampons earlier sensibly placed (so we thought) at the bottom of the sac! 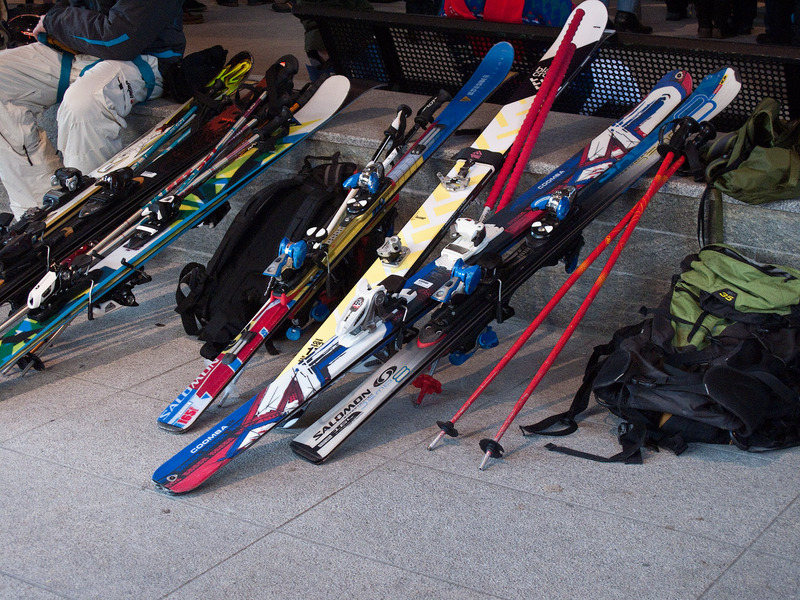 Secure skis and poles to rucsac, shoulder pack. Then after the straightforward fixed rope section, it was time to reverse the previous processes and get kitted out to start skiing again. Thankfully the stance for this was not so precipitous. The time was now 12:50. As we descended and the day passed, the slopes softened. For those skiing anywhere in the Alps in April 2011, you may remember the over-heating that happened. Temperatures were 20C+ in Chamonix and the conditions more suited to May than April. Even in the Vallée Blanche the lower slopes were composed of knee-deep snow of porridge-like consistency. On tired legs and with a back pack this was not easy to ski. Face-fulls of snow became a regular feature and extricating oneself increasingly exhausting – the only redeeming feature of falling being that you cooled down a bit with snow down your neck! Finally, we completed the last major descent (13:20) and from there it was a ski out down the last 4-5 miles of the Mer de Glace – initially down gently undulating slopes pursuing a meandering course around hidden crevasses. But later we were skiing a ribbon, in some cases a thin veneer, of ice down the rock strewn surface of the glacier. On the day we skied down, it was possible to ski to about 100metres from the point at which you descended off the glacier to pick up the stairways up to the Montenvers station. We finally reached Montenvers at 15:00. I lost count of the number of stairs we climbed before picking up the final small gondola that assists the last section of the climb. But what I remember was finding one shocking statistic. I had counted a few more than one hundred steps up the stairway when we reached a plaque attached to the rock wall to which the stairway was bolted. There couldn’t be a more sobering statement concerning glacier shrinkage and global warning than pausing at that point and glancing down at the glacier now a considerable distance below us and realising how much shrinkage had occurred in little over a decade. Back up at Montenvers train station, waiting for the cog railway, there was time for a well overdue Beer and a view across the Mer de Glace to the mighty Drus with memories of Walter Bonatti’s extraordinary solo climb of the SW pillar of the Dru – click here to see my post commemorating Bonatti. 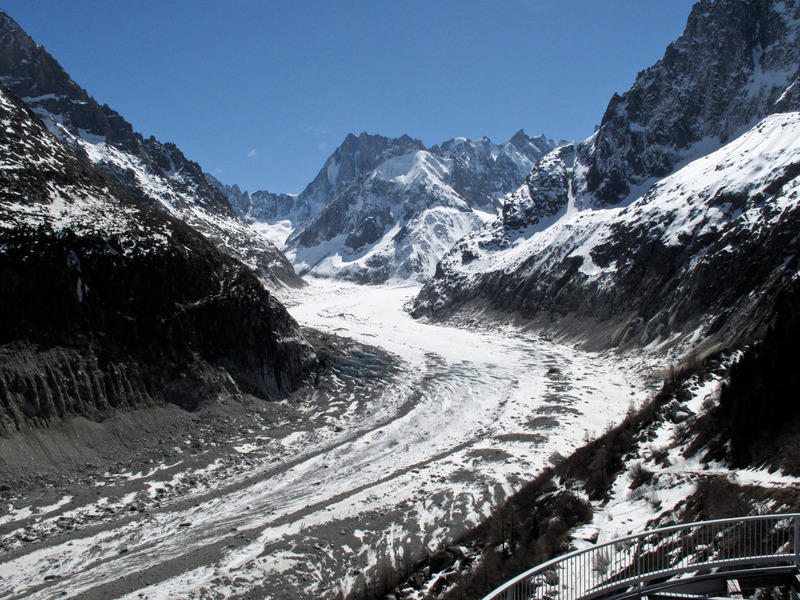 And a chance to look down on the snake of the Mer de Glace and the parties of skiers still slaloming down that same thin veneer of ice that we had recently descended. Did I really recently make that extraordinary descent? Perhaps it was a good thing I bought the guidebook after the descent rather than before. Reading the description of the Combe de la Vierge route I read: ‘Excellent technique is needed to ski the steep and highly crevassed slopes on the right bank of the Seracs du Geant, as a fall could have very serious consequences’. No wonder it felt tough at times! A few images in this post are © Andrew Quentin – one of my fellow skiers on this trip – and are used with his permission. Capturing all the right images on a group trip is difficult. Photography has to take second place to the movements of the group and group safety in a potentially dangerous high mountain environment. Thanks Andrew. Visit the Maison de la Montagne (to the right of the main Catholic Church near the Tourist Office in the centre of Chamonix). Weather forecasts are posted outside this building and therefore available 24/7. 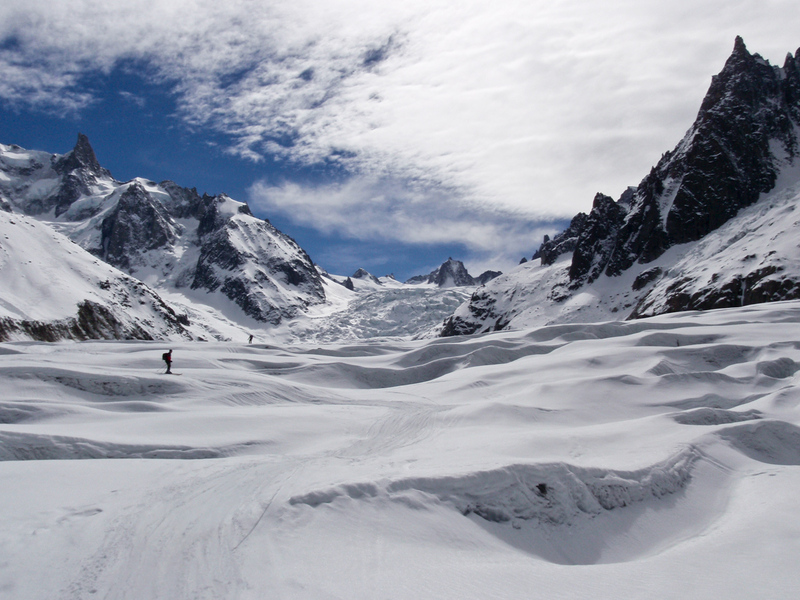 Official Chamonix website including weather forecasts – click here. 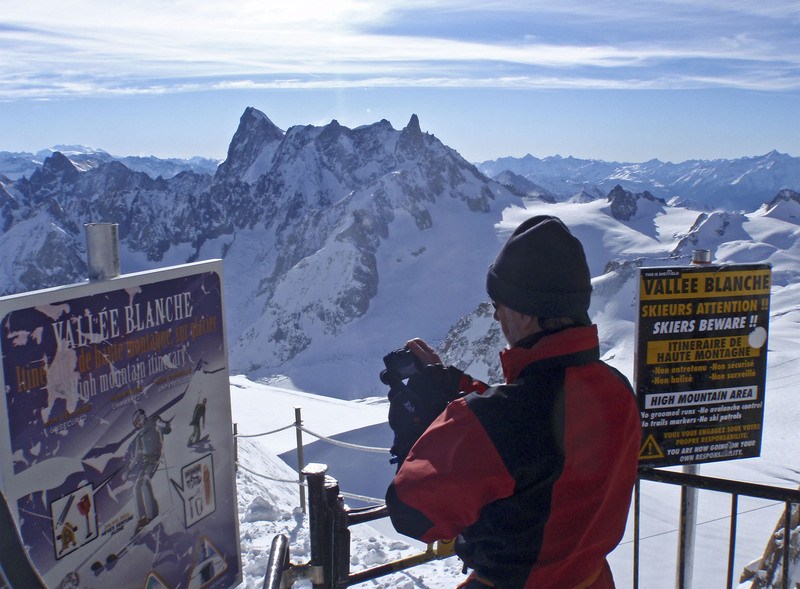 Specific information about the Vallée Blanche is to be found on the OHM webpages. Click here. At the time of writing there is a PDF specifically about the Vallée Blanche on the OHM pages: click here to view it. 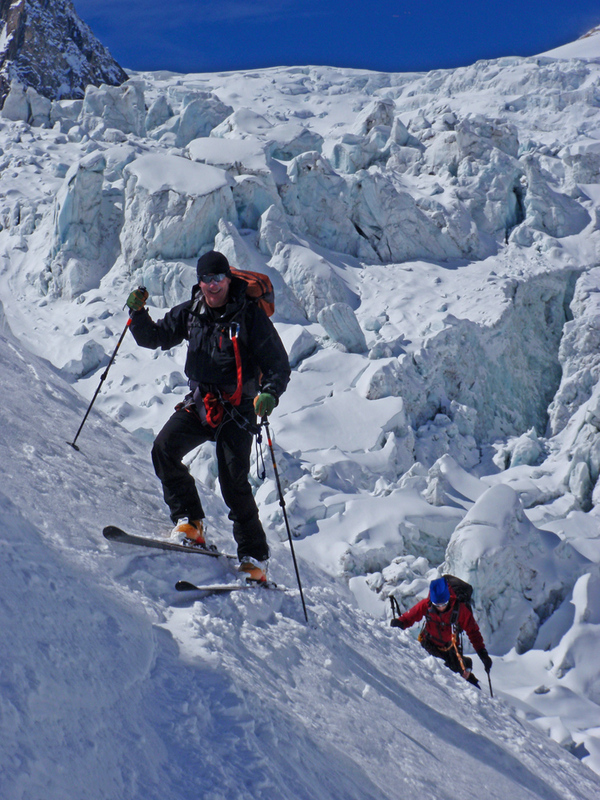 An excellent guidebook is available covering all descent routes: ‘Vallée Blanche’ by Francois Damilano. This may be available through Amazon but you will find it cheaper in Chamonix – at the Aig du Midi base station, and in the town’s bookshops. It is available in an English Edition. Well recommended. Finally don’t take my word for the detail within this post. Do your own research and speak to the experts. Go prepared. 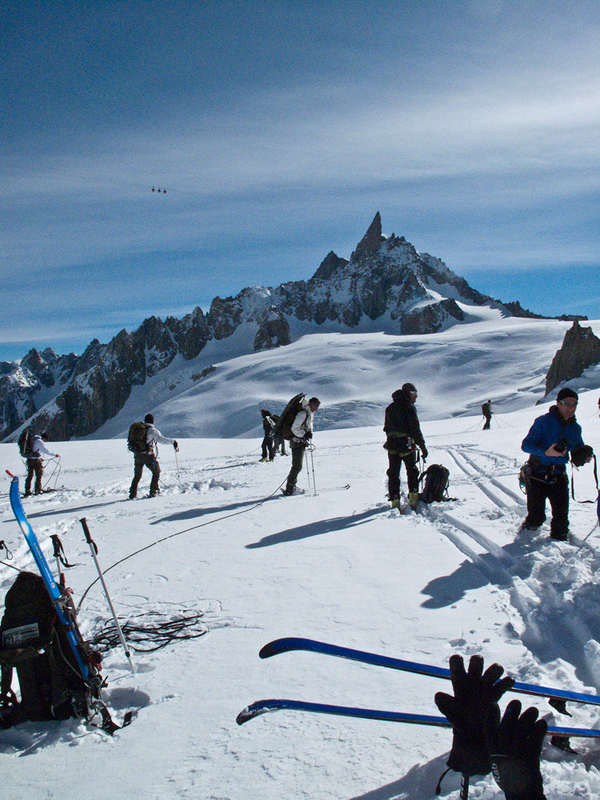 This entry was posted in MountainScape, Skiing - Chamonix and tagged Aiguille du Midi, Combe de la Vierge, Dent du Geant, Glacier du Geant, Grandes Jorasses, Helbronner, Italian Variant, La Tour Ronde, La Vallee Blanche, Les Drus, Midi Arete, Mont Blanc du Tacul, Seracs du Geant, The greatest off-piste ski run in the Alps, Vallee Blanche. Bookmark the permalink. Great post Andy and stunning photos. Wow, what an adventure Andy. I am sure that this has to be one of the favorite things that you have ever done. Fabulous images. I would live to shoot these magnificent mountains but not being a skier, it is unlikely. Great post. Thanks Len. Yes, this was up there with a few other major outdoor climbs and treks I have been lucky to complete. The Aig du Midi is a very popular tourist visit in summer – it is at the centre of an extraordinary panorama of some of the highest peaks in the Alps. Excellent post Andy! What an adventure and you have some beautiful images as well as your memories. It sure looks like a lot of hard work you put into it and well worth it. Like Len, not being a skier, I wouldn’t get a chance to make images like these. Nicely done! Thanks very much for your comment, Anne. All shot on a Canon G10. Tricky using a small compact with gloves. During the descent the repeated in/out of pocket resulted in the ISO dial changing to 400 from its setting of 100. Something that can so easily happen. Thankfully I spotted it but a few shots shot at that setting (that resulted also in a very high shutter speeds) had a lot of unwanted noise. Could have been worse. You just can’t see the screen or histogram in that light glare. Great post, interesting and with some superb images. Great images, Andy. And a lot of fun, too. Thanks Ken. It felt like hard work at the time! The ‘fun’ factor increases with the memories I find when you forget the exhaustion…. Fantastic post Andy and these images are outstanding. I don’t know that I would be up to an adventure quite like this but its fun to live it through you. Many thanks Edith, and for your kind comments. Wonderful post, Andy…I enjoyed the narrative and absolutely loved the photos…seems like quite an accomplishment…I can imagine being exhausted and so thankful to be sitting there at the end with beer in hand…probably in stark amazement at what you have just completed. Good for you, my friend! Despite the popularity of the traditional VB route, it has to be one of the best ski descents that an average skier could aspire to. I really like the look of your route for the day though, but if I do head that way I’ll be sure to keep my crampons at the top of the sack! Many thanks for your comments, Paul. I intend to ‘do’ the Classic Route before too long. Undoubtedly what we did added interest and valuable experience of skiing uphill, but I think that route loses out a bit through being tucked over to the extreme right bank for the passage through the Seracs du Geant. And the snow lower down was so soft (Ugh!) – but you have to take what you are given! It was an interesting experience unpacking a rucsac on a 45degree slope. Why is it that what you need most is the hardest to reach at the bottom of the sac? What a breathtaking post! I think I am an avid skier myself, but this looks pretty challenging to say the least. But it must have been a great experience, particularly with the kind of weather you had. So many stunning pictures. All beautifully capture. Many thanks Otto. Yes it was a challenging experience. 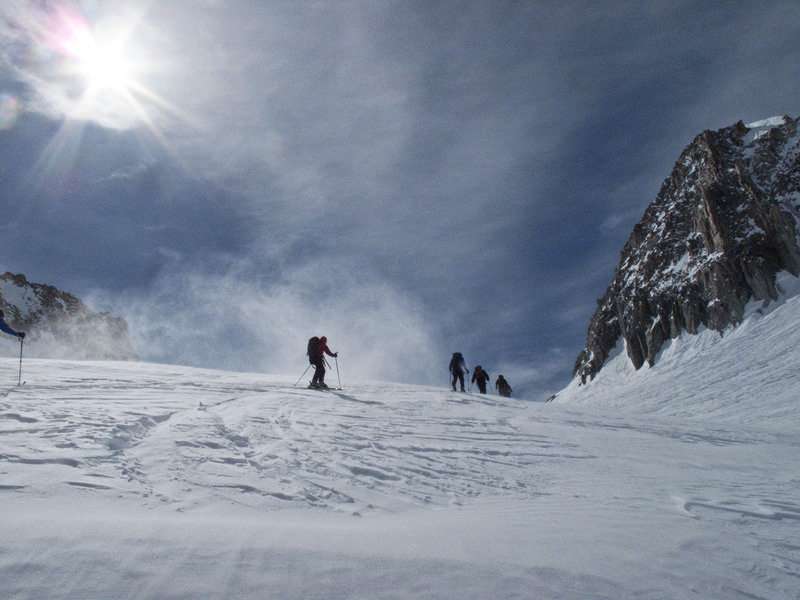 The weather was superb – hardly any wind – except for the high temperatures lower down, that made the skiing through deep soft snow strenuous work. Those are some amazing mountain peaks! I love how they are so sharp and steep jutting right out of the ground. What a fantastic adventure. Thanks for sharing! Thanks very much Rick. 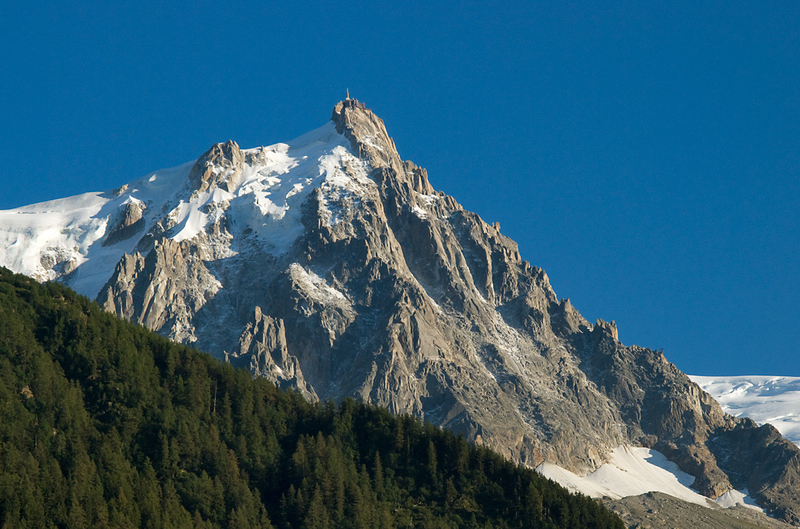 The peaks around Chamonix are often called ‘Aiguille’ in French – which means Needle. Aptly named as I I’m sure you will agree from your own observations. 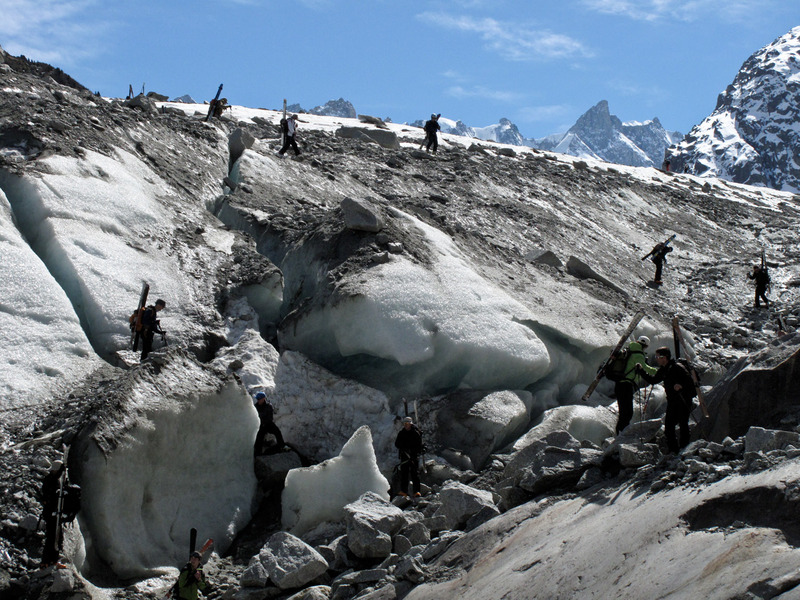 Chamonix is the Alpine centre for extreme mountaineering. Absolutely terrific photography here Andy, and your accompanying post is riveting! Fabulous post, I really enjoyed this one a whole lot! Thanks so much Toad. I really appreciate that. wow Andy this is some awesome post with great pics to boot! looks like fun! !